Profile: The capital city of the UK and, with a population of around seven and a half million, home to around an eighth of the population. 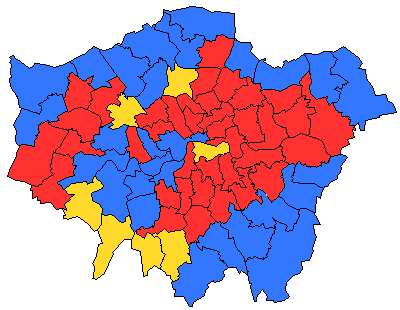 Following boundary changes there are 73 seats in London and unlike many of Britain’s large cities London remains competitive for all three of the political parties (and in some specific areas, fringe parties like Respect and the BNP). The leafy suburbs in the Kentish part of the capital and the exclusive enclaves of the super-rich in Kensington, Chelsea and Fulham are Tory strongholds, the turmoiled council estates of south London and the now largely Asian east-end are normally safely Labour, in affluent South West London the Liberal Democrats have replaced the Conservatives to be the dominant party. Between the Tory suburbs that ring much of London and the largely Labour held inner city there is a belt of marginal seats that will decide the next election. Since 2000 London has been governed at a local level by an elected Mayor, currently Ken Livingstone – the leader of the old Greater London Council when it was abolished in the mid-1980s. It is elected using a system of alternative vote with the next elections in 2008. The mayor is held to account by the London Assembly, elected on a proportional representation using 14 large multi-borough constituencies and 11 members returned from London wide top up lists.